I had a big adventure planned and my food was be essential. Planning and prepping and creating meals was half the fun. My goal was to have a variety of amazing meals to bring along with me. All created from dehydrated “something”. (laughing) This of course meant I am going to be doing a lot of experimenting. Weight played an essential roll in my meal prep: as well as taste, ease of menu and shared ingredients. I created 15 different meals so I had a tremendous variety on the trail. I also dehydrated fruit; apples, strawberries, oranges, watermelon, as well as some fruit roll-ups from Backpacker Gourmet. I also dehydrated 6 LBS of salmon into jerky. 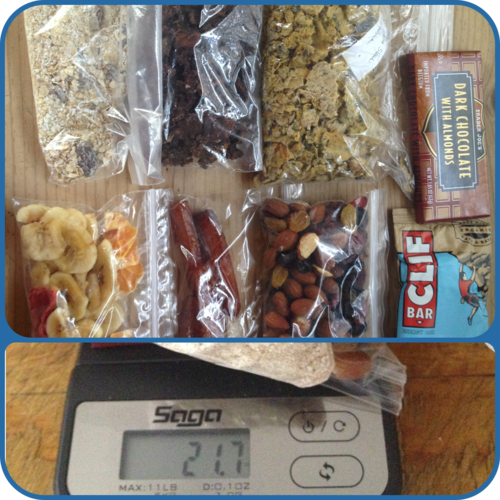 My daily food plan was as follows: 4 oz Hot breakfast, 1.5 oz fruit, 1.5 oz salmon jerky, 2.5 oz trail mix, 4.5oz hot meal for lunch, 4.5oz hot meal for dinner, either a chocolate bar or cliff bar. Weighing a total of 21.7 ounces. I actually ended up over-packing food by one hot lunch. But this was nice to have on days I was really hungry. It also allowed me to pass on some trail love to the hikers who were under prepared.